Home › Home and Kitchen › Grill Master 932F Heat Resistant Oven Gloves - En407 Certified Grilling Glove.. Grill Master 932F Heat Resistant Oven Gloves - En407 Certified Grilling Glove..
BEST OVEN GLOVES - Grilling Gloves, perfect pot holders and oven mitts replacement. Best quality firefighter materials for our extreme heat resistant gloves. This means the hottest objects you touch feel cool. EN CERTIFIED TO 932F & MULTI-PURPOSE instead of your pot holders use heat resistant oven gloves great as pot holders, bbq gloves, hot mitts, oven mitts, smoking gloves and handling hot cast iron, camping grill, iron skillet and more. FREE AMAZING BBQ eBOOK including grilling tips - discard your inferior oven mitt or hot mitts now and enjoy #1 grilling gloves complete with great BBQ recipes your oven gloves with fingers for safety and control. SAFE & EASY TO CLEAN - machine washable so cleaning gloves is super easy. Never burn as you did with your old hot mitts, smoking gloves instead stay cool with your new oven gloves with added silicone stripes for high grip. ORDER WORRY FREE your oven gloves from Grill Master Gloves, a name you can trust for great grilling and replacing your old oven mitt / pot holders if not 100 % satisfied easily receive your money back. Your Search For The Best Oven Gloves Is Over! Purchase From Us Today And StopBurning Your Hands! 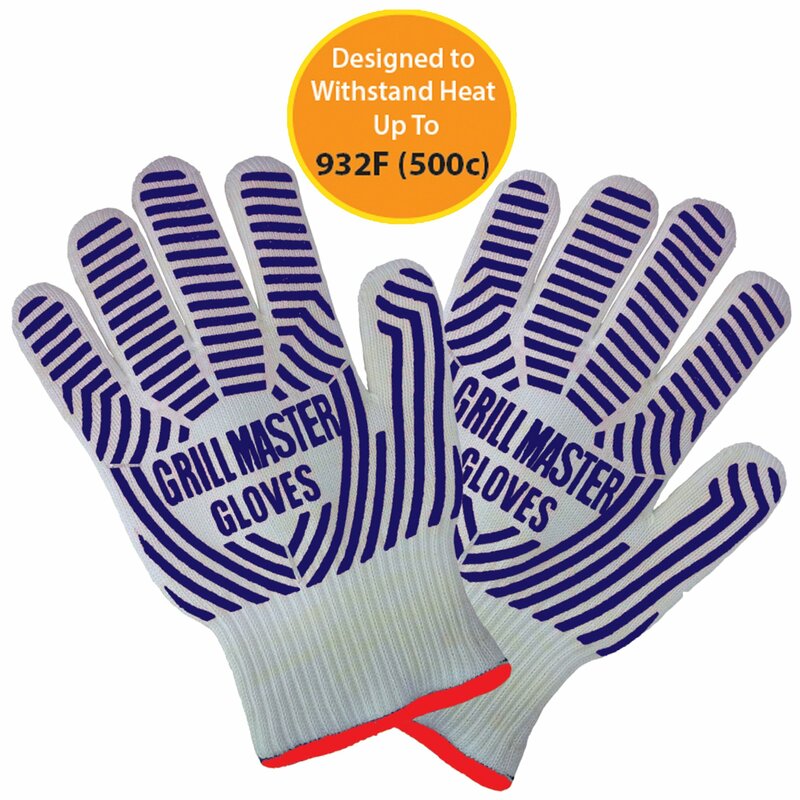 Instead Stay Cool And Enjoy Your Grilling Grill MasterGloves raises the bar with EN 407 932F Certified Grilling Gloves designed tobe more heat resistant and safer than any other brand of oven mitts and potholders, grilling gloves and hot mitts. Simply enjoy your grilling / cookingexperience every time with the best heat resistant gloves ! BENEFITS •Unlikeother brands of grilling gloves / oven gloves they are made from the bestquality materials used by firefighters with exterior layer of Para & Metaaramid fibers that insulate and protect from high temperatures with 100%cotton lining interior for maximum comfort control and flexibility. •Use themas smoking gloves, hot mitts on or around fireplace, cast iron, grilling pans,camping grill, bbq, iron skillet, microwave, weber and more. Move hot itemswith ease in the kitchen or while grilling like no oven mitt or hot mitts cando. •10 finger design is much easier and safer to use than any oven mitts orpot holders. They are right handed and left handed and easy to put on and takeoff. Cleaning gloves is easy as they are machine washable and long wearing•They protect from direct flame as well as hi temp heat. Outer layer isfireproof and does not burn or melt when exposed to open flame. Unlike otherbrands they also provide protection past your wrist due to the longer length.• Unlike pot holders and oven mitts safely move hot logs on a fire or change alight bulb! Please note gloves do not protect against heat from hot liquids.OUR HEAT RESISTANT GLOVES PROMISE Buy a set of Grill Master Gloves GrillingGloves With A Better Than Any Pot Holders / Oven Mitts Offer 100 % No HassleMoney Back - Click The 'Add to Cart' now and why not even consider getting twopairs, one for you and one as a gift.